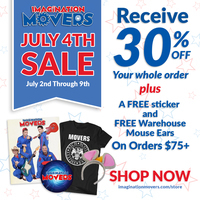 From August 16-24, enjoy the Imagination Movers BACK TO SCHOOL sale. During this time, save 25% off your whole order. Plus, you'll receive FREE domestic shipping on orders $40 or more. 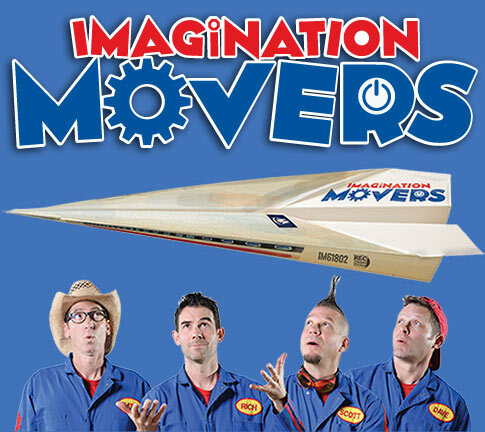 Visit Jefferson Parish just launched their new "Just Imagine" marketing campaign featuring the Imagination Movers! The Movers are featured in three exceptional videos showcasing many of the wonderful places, adventures, and culinary experiences one can have - just a dash down the road from New Orleans. Indeed, there's world-class dining, sporting events, and outdoor escapades, awaiting anyone and everyone who wants to make Jefferson Parish a destination. Just imagine! Get ready for the summer during our July 4th 30% off sale.